Thinking about dentures or implants? We can help you decide which is the perfect option for you. For a lot of people, dentures are a part of everyday life. But when it comes to maintaining your dentures, there are a few steps you should take to look after them for years to come. 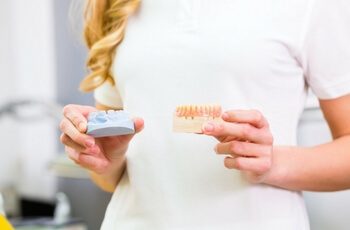 Whether you have been wearing dentures for a while or are just learning how to care for your new teeth, here are a few helpful tips to keep them as good as new. 1. Brush your dentures daily. This is necessary to help remove food and plaque. If you regularly use denture adhesive, you’ll want to clean the interior grooves that fit against your gums. 2. Be gentle. You shouldn’t ever force or bend your dentures when handling them. 3. Overnight soaking. If you soak your dentures in a solution overnight, don’t forget to rinse them before putting them back into your mouth as denture solutions can contain harmful chemicals. 4. Visit our practice. Regular checkups can help avoid slippage and discomfort. Adjusting to new dentures can take time and may feel different to what you’ve been used to at the start. With time, they should start feeling normal. If your dentures are causing pain, irritation or other difficulties, it’s important to book a visit with our practice to get to the bottom of the issue. We always want our patients to feel comfortable with their new smile!